The rich, malty flavor of Guinness Stout makes a perfect match for beef. 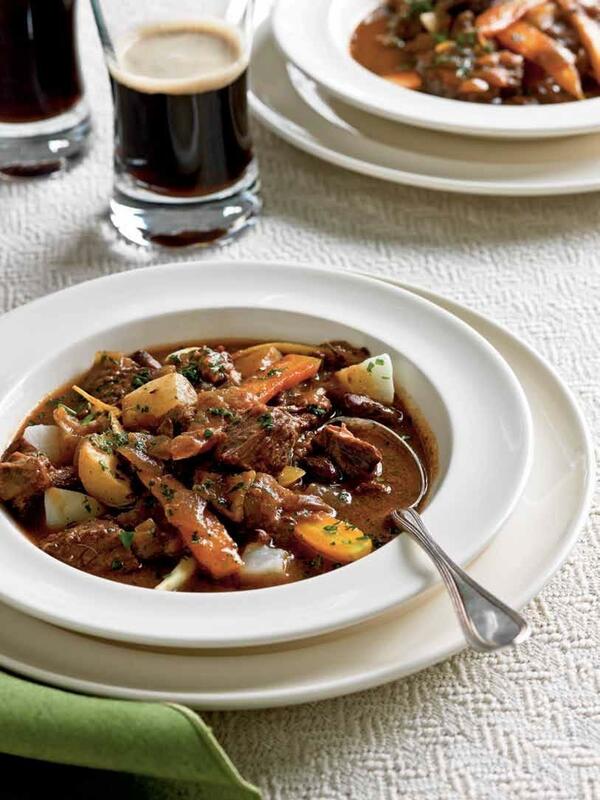 In this classic Irish stew, the ingredients simmer for a while, during which time the beef chuck, onions, carrots, parsnips, and turnips all soak up the earthy broth. Thanks to Margaret M. Johnson, author of seven cookbooks on Irish cuisine, for sharing this classic recipe. Heat a Dutch oven over medium-high heat. Add 1 1⁄2 tablespoons oil to pan; swirl to coat. Place flour in a shallow dish. Sprinkle beef with 1⁄2 teaspoon salt; dredge beef in flour. Add half of beef to pan; cook 5 minutes, turning to brown on all sides. Remove beef from pan with a slotted spoon. Repeat procedure with remaining 11⁄2 tablespoons oil and beef. Add onion to pan; cook 5 minutes or until tender, stirring occasionally. Stir in tomato paste; cook 1 minute, stirring frequently. Stir in broth and beer, scraping pan to loosen browned bits. Return meat to pan. Stir in remaining 1⁄2 teaspoon salt, raisins, caraway seeds, and pepper; bring to a boil. Cover, reduce heat, and simmer 1 hour, stirring occasionally. Uncover and bring to a boil. Cook 50 minutes, stirring occasionally. Add carrot, parsnip, and turnip. Cover, reduce heat to low, and simmer 30 minutes, stirring occasionally. Uncover and bring to a boil; cook 10 minutes or until vegetables are tender. Sprinkle with parsley.